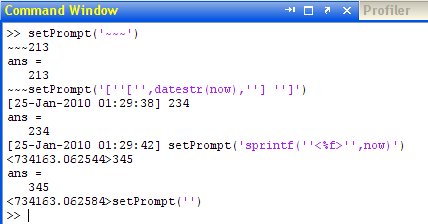 A few days ago, a reader emailed me with a challenge to modify the standard matlab Command-Window prompt from “>> ” to some other string, preferably a dynamic prompt with the current timestamp. At first thought this cannot be done: The Command-Window prompts are hard-coded and to the best of my knowledge cannot be modified via properties or system preferences. So the prompt can (probably) not be modified in advance, but what if it could be modified after being displayed? It is true that my cprintf utility modifies the Command-Window contents in order to display formatted text in a variety of font colors. But this case is different since cprintf runs once synchronously (user-invoked), whereas the prompt appears asynchronously multiple times. There are two methods of handling multiple asynchronous events in Matlab: setting a callback on the object, and setting a PostSet handle.listener (or schema.listener) on the relevant object property. The first of these methods is a well-known Matlab practice, although we shall see that it uses an undocumented callback and functionality; the PostSet method is entirely undocumented and not well-known and shall be described in some later article. I decided to use the callback method to set the prompt – interested readers can try the PostSet method. % Does the displayed text end with the default prompt? In this code snippet, note that we space-pad prompt string that are shorter than 3 characters: this is done to prevent an internal-Matlab mixup when displaying additional text – Matlab “knows” the Command-Window’s text position and it gets mixed up if it turns out to be shorter than expected. Also note that I use the semi-documented awtinvoke function to replace the default prompt (and an automatically-appended space) on the Event-Dispatch Thread (more on this in a future article). Since Matlab R2008a, I could use the more convenient javaMethodEDT function, but I wanted my code to work on all prior Matlab 7 versions, where javaMethodEDT was not yet available. I then added some edge-case error handling and wrapped everything in a single utility called setPrompt that is now available on the File Exchange. In the future, if I find time, energy and interest, maybe I’ll combine cprintf‘s font-styling capabilities, to enable setting colored prompts. Can you come up with some innovative prompts? If so, please share them in a comment below. Update 2010-Jan-26: The code in this article was updated since it was first published yesterday. Very Interesting. Have you found any issues with operations that make assumptions about the prompt, such as tab completion, or copying/pasting to the Editor? Hi Mike – Since the original post I have discovered two minor edge cases – when clearing the window (clc) and when invoking other windows (e.g., edit). These issues have since been fixed in the posted code as well as on FEX (should be available later today I guess). The only unsolved issue I have seen is that when selecting desktop text and pasting to the Editor, the prompt is not stripped as it is with the default prompt. Otherwise, the new prompt appears to work exactly as expected, with copy/paste, selection/F9, tab completion, help popups, history/editing etc. The Editor-Desktop interaction also works exactly as expected (aside from the known issue above). I haven’t tested thoroughly on non-Windows platforms and/or multiple Matlab releases, but I expect the changes to be minor at worst. Regarding assumptions, there are two inherent: that the default prompt ends with ‘>> ‘ and that the desktop TextArea can be accessed as described (this depends on the undocumented internal hierarchy, which may change between releases). For the moment these assumptions seem valid. Update: I have received a report that setPrompt fouls up the Command Window (CW) on Mac platforms. Since the utility’s code and the CW is Java-based, I have a feeling that the problems are due to bugs in the Java used on MacOS (there are numerous other problems with Java on Mac that affect Matlab). I can’t test this since I have no Mac. Oh well – I guess we’re left with using setPrompt on non-Mac platforms. I would love to hear specific details about similar compatibility issues. I would like to catch everything that will be printed in the command window and be able to send it to a remote PC via udp. Can you suggest what callbacks/ approach may be useful in doing this? Can this function be improved to make the user difined prompt as the default one instead of calling setPrompt to manually set on each MATLAB session? @junziyang – yes: you can add the setPrompt command to your startup.m function and it will be used in each Matlab session automatically. 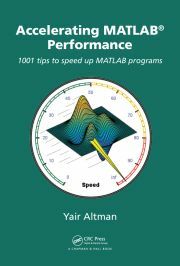 If you don’t have a startup.m file, simply create one in your Matlab startup folder – it’s a simple Matlab script file that contains commands that run automatically whenever Matlab starts in that folder. I’ve been looking for a decent prompt control/replacement for a *very* long time! This is fantastic! I do have one question/request. Mostly I run MatLAB in a term (gnome-terminal/konsole/whatever) and not from the MatLAB GUI (matlab -nosplahs -nodesktop). Would your approach work for modifying the prompt in a console? Maybe something like setPromptCon..? It helped me to show the command line output in my own GUI. The name 'CaretUpdateCallback' is not an accessible property for an instance of class 'com.mathworks.mde.cmdwin.XCmdWndView'. It seems as the CaretUpdateCallback is not available on the mac (Matlab R2014a, Os X, v10.9.4), would you have a workaround for this? Does this work in Windows MATLAB R2018b? Or would someone mind demonstrating how to change the prompt in R2018b via command? @Steven – did you even bother to download and try setPrompt() before posting your comment? !